June 21, 2018 By Elizabeth Lindemann 2 Comments / This post may contain affiliate links. 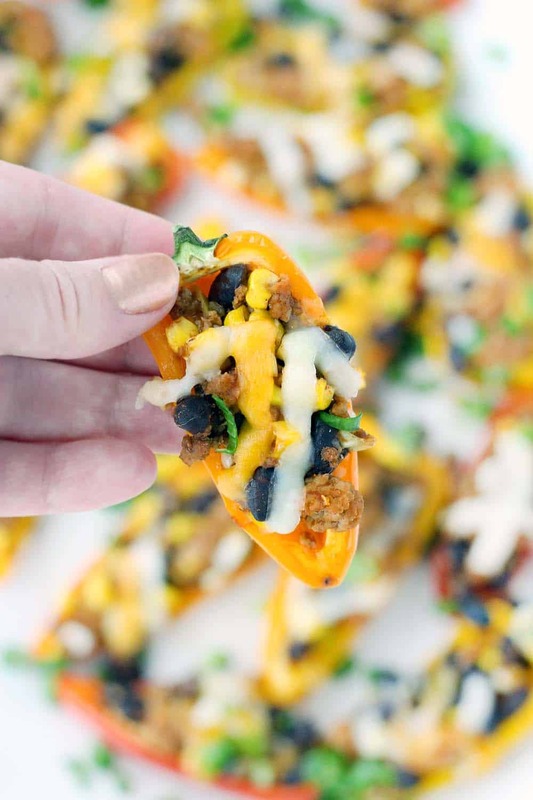 These Taco Stuffed Mini Peppers are the perfect low-carb, kid-friendly finger food. 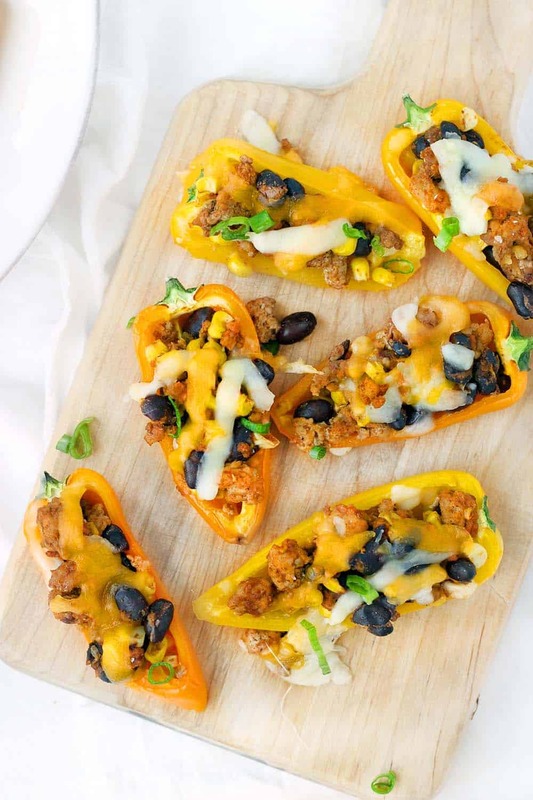 Sweet mini bell peppers are stuffed with a mixture of cooked ground turkey, black beans, corn, and taco seasoning, then baked and topped with melty cheese. Even my husband, who notoriously doesn’t like stuffed peppers (“they’re too… peppery”) liked these and dubbed them the best stuffed peppers he’s had! 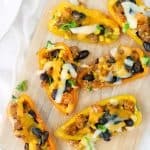 The mini sweet bell peppers have such a great sweet flavor that pairs really well with the mild spice of the taco seasoning, and the ingredients are super light and healthy. These tasted amazing, were filling but didn’t weigh us down, and also super fun to eat. This is a great low-carb alternative to tacos in tortillas. You can make it even lower carb by replacing the beans with more meat, and omitting the corn (or replacing it with another vegetable like zucchini or tomatoes). You can also use ground beef instead of turkey, or even crumbled veggie burgers for a vegetarian version. I also love that they are perfect for an appetizer or as a meal on their own. 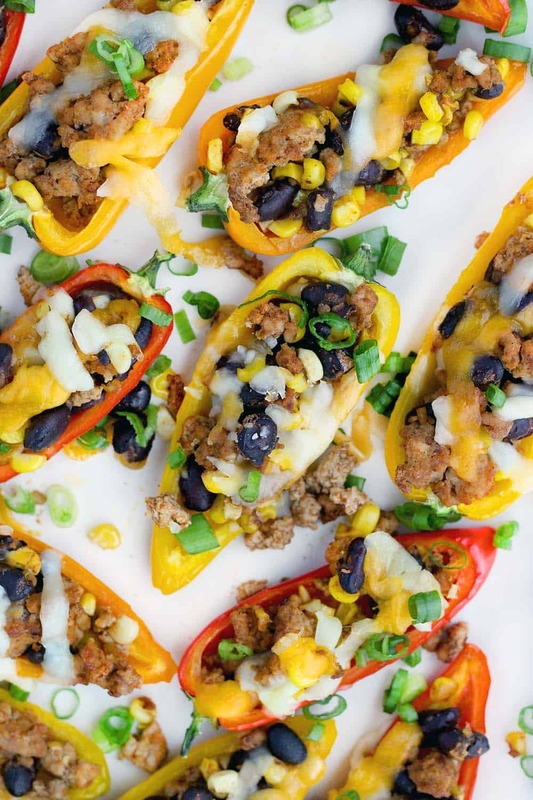 These mini stuffed peppers are super flexible, which is one of the best parts about them. In order to fill 16 peppers (32 halves), you don’t need very much filling, since they are so tiny. In fact, only 1/2 lb. of ground turkey, 1 cup of cooked black beans, and 1/2 cup of corn is enough (making this recipe super budget friendly as well!). But since ground turkey comes in 1 lb. packages, and a whole can of black beans is usually 1.5-2 cups, I went ahead and doubled the ingredients needed for the filling. I had extra, which I used to fill tortillas with cheese for easy tacos, and served with eggs for breakfast, throughout the week. It was perfect for my toddler! The filling is seasoned with regular old taco seasoning. I’ll be honest- I just used a premixed packet (I checked them for the one with the most natural ingredients- some have added sugar or chemicals). But it’s super easy to make your own, or even find it in the bulk spices section of your grocery store. Just brown the turkey in a little bit of oil in a large skillet (I used canola for its neutral taste, but you can use olive if you want). Then, add the taco seasoning, black beans, and corn. Add a little water to thicken it up and make it saucy. Meanwhile, cut the peppers in half and take out the seeds and ribs. I left the stems intact, which helped the structural stability of the peppers. When you fill the peppers, it is a little bit challenging, since they are so small. I used a small spoon to scoop the filling into each one and pressed down in order to fit as much as possible. Some will spill out- that’s OK. I lined my baking sheet with parchment paper so clean up would be super easy. I baked the peppers for 15 minutes at 350 degrees, THEN added the cheese and baked for 5 more minutes. This caused the cheese to get melty but not too browned and crispy. I used a thick cut pre-shredded Mexican cheese blend, but next time I’ll use thinner shredded cheese in order to cover more surface area. Because more gooey cheese is always better. I finished these taco stuffed mini peppers off with some thinly sliced green onions. I usually do cilantro on top of almost all Mexican or Tex-Mex recipes, but since I didn’t cook the filling with any onions, I added them on top instead. Delicious! One more thing- you can easily assemble these stuffed peppers in advance (minus the cheese) and refrigerate for up to two days before baking. If you like this recipe, you’ll love this Veggie-Packed Southwestern Meatloaf and this Crockpot Turkey and Vegetable Chili! 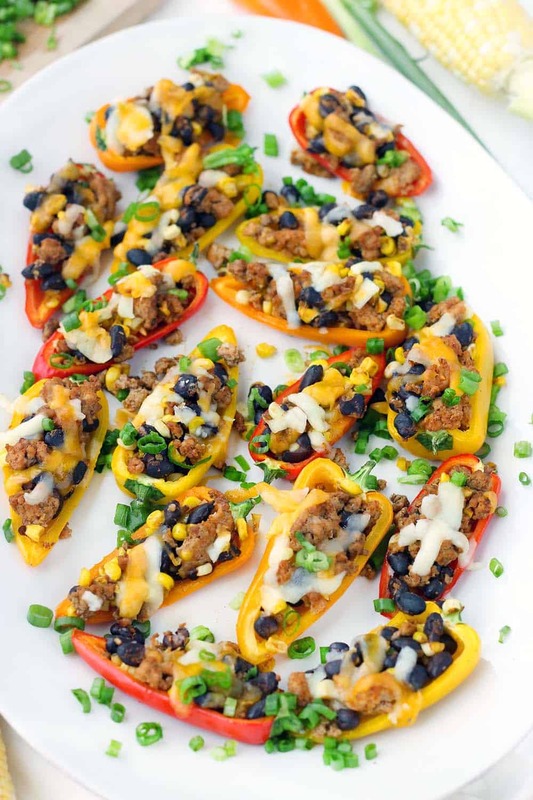 These Taco Stuffed Mini Peppers are the perfect appetizer or light meal! 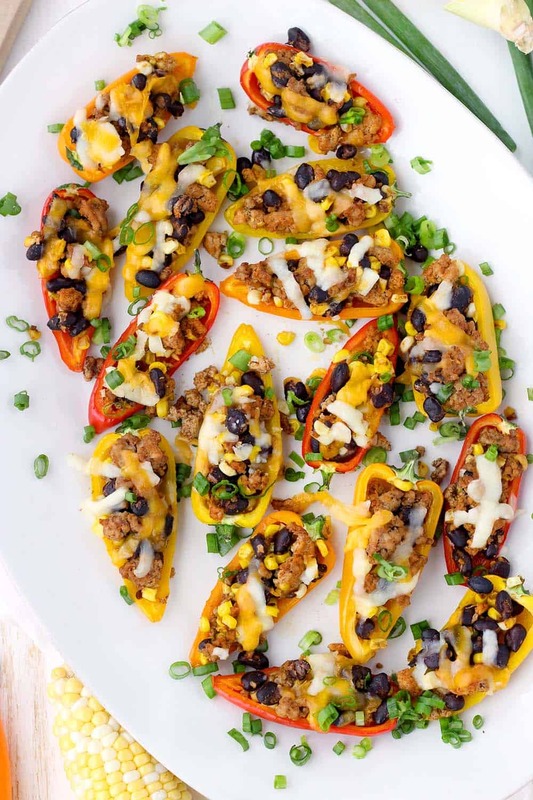 The sweet mini peppers are filled with slightly spicy, taco flavored ground turkey, black beans, and corn for a super fun, low-carb finger food. In a large heavy skillet (I used cast iron), heat the canola oil over medium high heat. Add the turkey and cook until browned and fully cooked and meat is broken apart. Add the black beans, corn, taco seasoning, and water, and cook for 2-3 more minutes, stirring occasionally, until beans and corn are heated through. Meanwhile, cut the mini bell peppers in half, leaving the stems intact and removing the ribs and seeds with a paring knife. Place the mini bell pepper halves on the prepared baking sheet and fill them as much as you can with the turkey mixture. Remove from oven, sprinkle on cheese, and bake for 5 more minutes, until cheese is melted. Since ground turkey comes in 1 lb. portions usually, I went ahead and doubled the ingredients (using a whole can of black beans) and saved the extra for filling tortillas, serving with fried eggs, etc. throughout the week. You can also freeze extra filling for future stuffed mini peppers. For an even lower-carb version, use 1 lb. ground turkey and omit the black beans and corn. If you want, you can add a lower carb vegetable, such as zucchini, tomatoes, etc. to the mix. Feeling spicy? Use large jalapeño peppers instead of bell peppers. You can assemble these stuffed mini peppers in advance and refrigerate for up to two days, then bake as directed. “Planned-over” stuffing is also good as omelette filling. I use refried beans to mix with the meat for neater picking-up at socials.